The hurt feelings from yesterday linger and we spend much of the day wrapped in our own thoughts. Although the Cabeza Prieta Wildlife Refuge is technically a protected, public space it doesn’t feel like a park. We both have a strong sense of pride for America’s park systems. Generally what comes to mind is a scenic area reserved for public use. What that fails to acknowledge is about twenty additional things our parks systems offer and that this creepy place does not. We haven’t seen even one designated foot trail so far, much less an actual walker. Everything is a road, marked by a tiny brown sign usually designating it for “Official Use Only”. Entire tracks of land on either side of us are off limits which makes cross country travel impossible. We are deliberately funneled through this park on one predetermined route. There are no footprints only tire tracks. We occasionally see where someone got out of their vehicle to pee, leaving at most five sets of footprints. Where are the regular paths that meander through mountainous terrain and are carefully constructed to a maximum width of two feet wide and showcase where hundreds of other people have stepped?? This much was obvious days ago when we originally applied for the permits and the permit issuer demanded our exact route within a list of locations they chose and which were non-negotiable. She then continued to interrogate us about our mode of transportation, which had to be a vehicle. And she would not accept the explanation that we were backpacking, she instead breezed past this and implied it’s okay to let her know the license plate number of our vehicle as the information would be confidential. We gave up arguing our case eventually and used Tenny’s license plate number despite the fact that it and her car were parked over 600 miles away. The complete absence of infrastructure for park visitors is also odd. The few campgrounds are deserted with a single picnic table and a tattered American flag. The water tanks on site are surrounded by barbed wire fence. And where are the people? No one sitting around the fire and roasting s’mores. There isn’t a ranger station within the park. There are no informational signs other than one at the entrance and exit. Parking lots are just wider sections of the road. The only consistent infrastructure are the towers that dot the landscape and provide a good vantage point for the cameras mounted on top. Creepy. It’s a shame because this place is actually really beautiful. Anywhere else in our country the Barry M. Goldwater Range and Cabeza Prieta would be a gem. People would travel from all over the country to gawk at the views and explore the peaks. 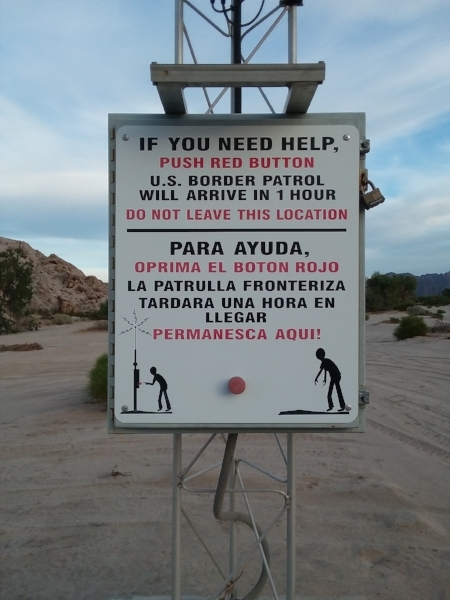 Instead, Border Patrol comprises the majority of the population, the infrastructure primarily functions for official use only vehicles and there are scary bombing noises and lights at night. Almost all of our encounters here are with Border Patrol. They are the park rangers of this area, albeit a bit more intimidating. They drive all sorts of contraptions; four-wheel drive trucks, sometimes with a topper on the back, sporty jeeps, ATVs, etc. So far we have yet to see terrain that they can’t get up. They are pretty stealthy too. A couple times we’ll be walking along only to turn around randomly and find them directly behind us. Or we’ll be hiking up a hill only to get to the top and find one idling and scoping out the entire valley. How long have you been looking at us? Two days ago a plain white jeep pulled up and the driver began a harmless conversation only to casually add he was an undercover Border Patrol agent. He had a hoodie over his uniform and he pulled up his sleeve to show us. His vehicle was unmarked yet equipped with official gadgets, antennas, mirrors, etc. It was obvious once we looked but it definitely threw us off at first. Papago Well - our campsite for the night - had both a windmill and a solar panel, and unlike Tule Well had no fence around the water tank. The spigot was easily accessible and drops of water continually built up around the nozzle and fell to the ground below. It’s an unusual sight to see water so casually swallowed by the desert. We’re happy to have water and the day has brought us back together again and we spend a peaceful night within hearing of another set of campers - the first of the trip!